Articles about our May meeting, featuring a Congressional primary candidate forum with Stephen Labate and Grant Lally, were recently posted in the Queens Chronicle and TimesLedger . The primary is June 24th. 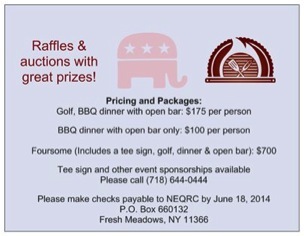 Our next gathering is our Annual Fundraiser on June 26th, with a golf outing during the day and dinner in the evening. Please attend both or either one. We need your support to continue providing events like this forum and the free Easter egg hunt. Don’t miss it! 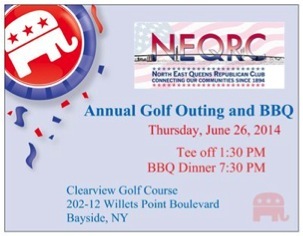 This entry was posted in Meetings/Events, News and tagged labate, Lally, neqrc, New York City Republicans, northeast queens republican club, Queens GOP, Queens politics, Stephen Labate, Steve Israel. Bookmark the permalink.